Sydney Shop Girl: Kiwiberries and Some Tender Loving Scrubbing For A Barefoot Beauty. Kiwiberries and Some Tender Loving Scrubbing For A Barefoot Beauty. With all the orange of my recent posts, it has been a real stretch to acknowledge any other colours of the rainbow. As usual, nature had her way of bringing me back to reality with some great greens. The green of the granny smith I had after getting my flu shot yesterday. I even got a lollipop for my bravery. My Uri Geller inspired bent teaspoon is still going strong and getting lots of wear. And kiwi fruit green. Mr SSG found me these kiwiberries from the fruiterer near where he works. I love them. They are less bitter than normal kiwis and can be eaten whole like cherry tomatoes. They are $6 a punnet though. I like the nutritional interaction between that can of coke zero with the fruit. So now that I've addressed my internal health, shall we move on to some beauty buys? As a prolific shopper of beauty and skincare products, I cannot believe that I have left it this long to discover Mecca Cosmetica's eponymous (my word of the day in lieu of orange) in house skin care brand. I was previously in a The Body Shop Groundhog Day that lasted for at least a decade. My favourites were the peppermint foot scrub and their various body scrubs. Then my sense of smell went wonky and suddenly everything from The Body Shop started smelling too strong and synthetic. Also, those scrubs that are creamy and dissolve in contact with water just really aren't my thing. So I hit the road on a body scrub finding mission. I have to say Mecca C isn't a bad (but exxy) place to start. On a whim, I opened a jar of Barefoot Beauty foot scrub and fell in love with its scent. It's a rich scent that is neither floral or fruity. I think it's woody / bamboo. But don't take my word for it. If you remember from yesterday, I can't even describe the smell of Sydney after it's been dunked in 10cm of rain. What I like about the Mecca C scrubs is that they are gritty and not too slimy. There is enough coarseness in the scrub to get a good exfoliation without any irritation. They are also very moisturizing. 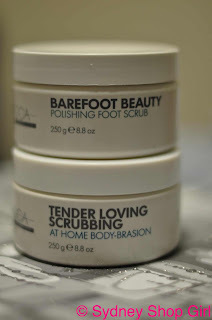 I was so excited with the foot scrub that I got through my existing body scrub extra fast so that I could try Mecca C's Tender Loving Scrubbing. What sane woman could possibly turn down the promise of at home body-brasion? It might have been just me but the scrub seemed to have a warming effect as I applied it. Again, just coarse enough grains in the scrub which was held together by a moisturizing, deliciously perfumed base. I think my skin is going to be just fine this winter. Dry body scrubbing and these two scrubs from Mecca Cosmetica will be my holy trinity. If only I could tackle my winter weather obssession with refined carbs and chocolate coffees from Max Brenner. My problem is viewing the obssessions as necessities against the cold. A dawn review of facebook is a crucial factor in deciding whether or not to attend your high school reunion. I had a very rewarding evening of television watching last night. I caught up with the first episode of Winners & Losers. I'm a big fan. It's funny, relevant to me and well put together with a great soundtrack. The 4 women at the centre of the series are strongly defined and I also liked how the minor characters were memorable as well. What started as a dreaded school reunion ended as a renewal of powerful friendships from highschool and a life changing event for all 4 women. I will be watching next week and continuing to identify with the 4 'losers' whose lives are so much richer and are so much better as people since leaving school and the catty, superifical 'winners' at all girls schools who seldom achieve much success once they leave year 12 behind. I'm not being bitter. I really enjoyed my high school years and am glad that the highlight of my life wasn't the year 12 ball. I also watched Sami Lukis' documentary about her journey to motherhood as an independent and successful woman in her 40s who is also single. There's a dilemma in that Sami knows this is now her time to have a baby but she also needs to decide whether she lets fate lead her to man to father her child 'naturally' or does she become proactive in these final years of her reproductive life. The option of assisted conception then opens the can of worms as to who will father her child? An anonymous donor or one of her close friends? It was interesting to hear the response of one of Sami's friends when she asked him to be a donor. Surprisingly, he would have not hesitated if Sami was in a relationship with a man yet because she was so single, he felt that it wouldn't be right for him to get involved. His reasoning was that without a father figure for the baby, he would then feel 'more responsible' and 'involved'. I suppose he saw his gesture as a single act of help for a good friend. I think this goes to show that there are so many ways of looking at fertility and assisted conception and that we all have our own beliefs as to what is 'best' as opposed to 'right or wrong'. Being judgemental of the decisions others make is neither apropriate or advised. I have great admiration for anyone, celebrity or not who is willing to share their stories about the rocky seas that sometimes occur in that time between deciding to start a family and finally having that family. For me, the most inspiring aspect isn't the final decision the person makes or what they suffered to get their baby but rather their bravery and honesty in simply telling their story and inviting strangers to share it with them. The problem may be common but the choices made and their outcomes will all be unique. It is the sharing of the journeys that give so many other people the strength and faith to carry on. I watched the Sami documentary and found all her friends' reactions interesting. It is indeed inspiring to hear other people's stories. Her dog is the same breed as my Fifi and Pierre but I couldn't believe the difference in their looks. She obviously has a much higher disposable income than me to spend on grooming! Hehe this is the second kiwiberry post I've read today! I love the little buggers-they're so much tastier than regular kiwi fruit! Love the bent teaspoon necklace. No wonder it is getting lots of wear... It's gorgeous. I'm a big fan of Winner's and Losers too - loved it!!! Can't wait for the next ep. Those Kiwiberries look so yummy!! I gotta find some around here! I need to watch the Sami documentary but honesty in a lot of infertility stories is often the most powerful thing. So many stories are different in both the journey and outcome, however one thing remains the same: the emotional, overwhelming and often heartbreaking desire to become a parent and what that means for people who struggle to have a child. 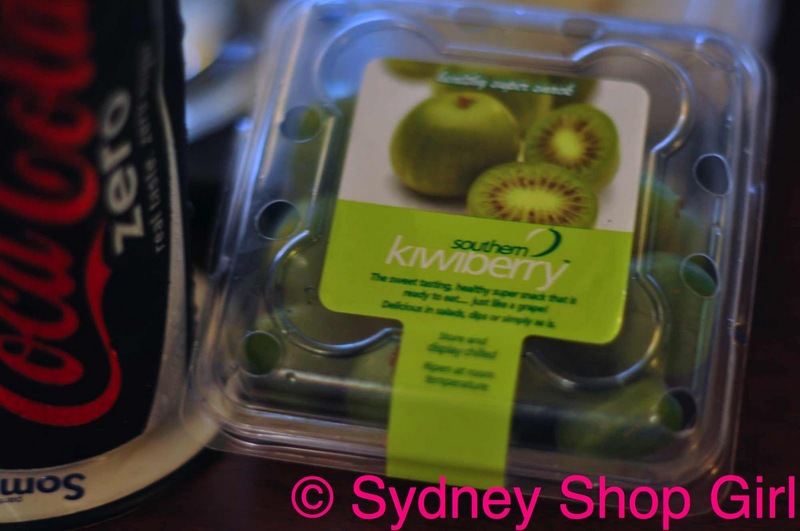 I have not tried Kiwi Berries - I will have to try and find some. They sound delicious and very healthy! Yay! We are all lovers of Winners & Losers and also keen on kiwiberries. Are kiwiberries a hybrid fruit? 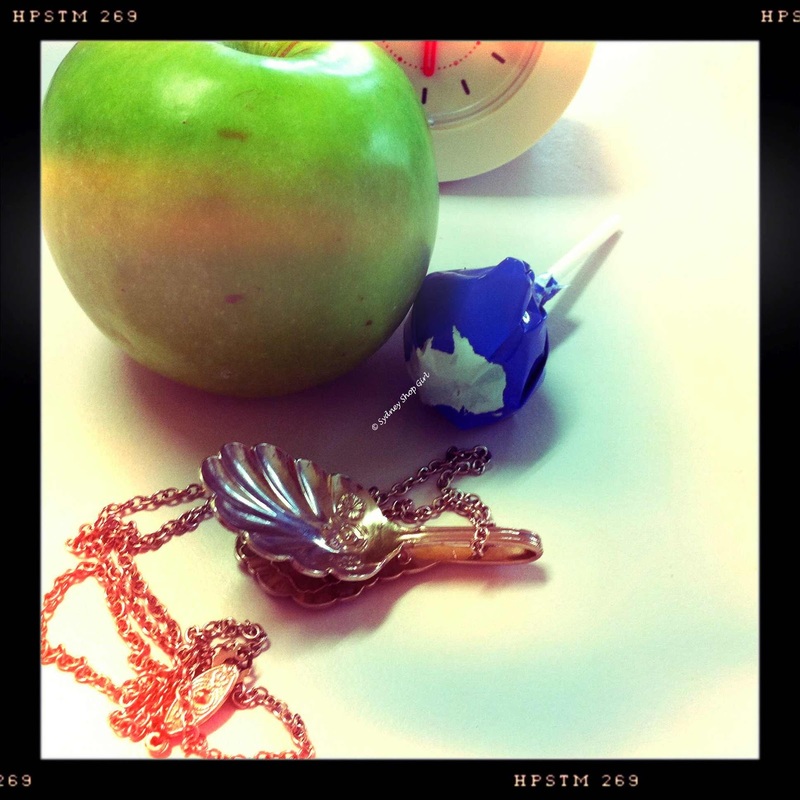 And is that spoon necklace what you bought when we hit the shops? I watched Winners and Losers. I identified, but it did not grab me. Though I would love to go to my 10 year reunion now and brag about my achievements. Pity it has passed when I was in hospital in 09 - I went to my 8 year reunion which was weird. I should have drank more to conceal the feelings of isolation. I also watched Sami Lukis on The Circle this morning. She didn't reveal much about her plight. Good on her for going public.